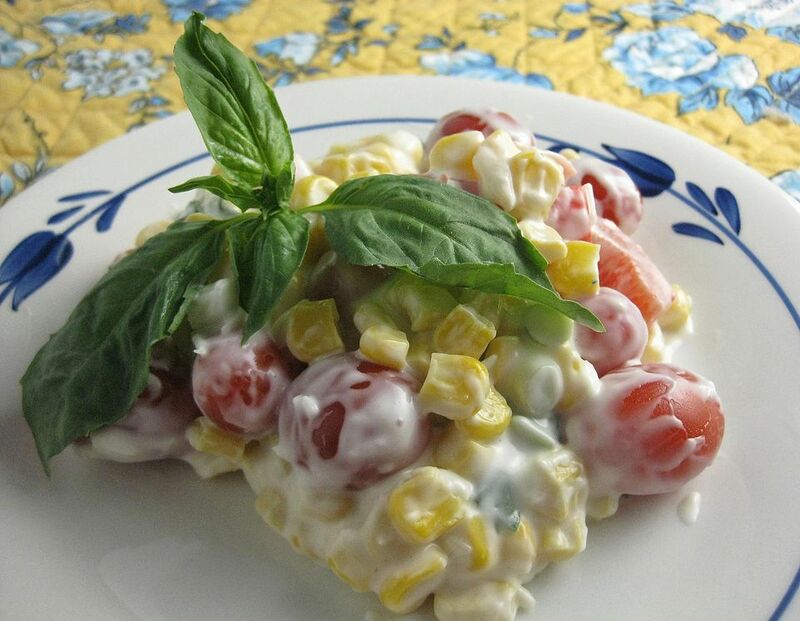 Fresh Corn Salad is my go-to salad in the summer. It really is best made with corn that is cut off the cob. You can substitute frozen corn for the fresh corn on the cob if you like. Don't cook it, just thaw and drain well before using in the salad so it's crisp-tender. The secret to getting the best corn is to use it as soon as you can after it's picked. It used to be true that the saying was "stroll down to the garden to pick the corn, but run back to put it in the pot." Now corn is bred to stay sweeter longer, and the sugar in the kernels doesn't turn into starch nearly as fast. Still, it's best to use corn as fresh as you can find it. This salad is fabulous served alongside a grilled steak or grilled chicken breasts. It can also be a main dish salad if you add some chopped cooked chicken or some cooked shrimp. You can also add other vegetables, such as sugar snap peas, tiny frozen baby peas, sliced yellow summer squash, or sliced celery. Enjoy this salad with a big glass of iced tea on the porch. It's perfect on a warm summer evening or as a cool lunch in the middle of a hot day. First, husk the corn and remove the silk. In a large pot of boiling SUGARED water, cook corn for 1-2 minutes. Really, this short amount of time is perfect - you just want to heat the kernels. Place the corn in a bowl of ice water and let stand 3-4 minutes. Cut the corn off the cob using a sharp knife. I like to stand the cobs on end in the center of a bundt pan. The kernels will fall into the pan and make less of a mess. Combine the corn kernels in a large bowl with the green pepper, onions, and tomatoes. In a small bowl combine the sour cream, mayonnaise, basil, garlic vinegar, Parmesan cheese, salt and pepper and stir to combine. Pour this dressing over the corn mixture and toss gently to coat. Chill for 1-2 hours before serving.